The video has sparked controversy with many criticising this extreme form of punishment. Staff forced to crawl for failing to reach targets / New York Post. A Chinese company has come under fire for "punishing" it's employees for reaching their targets. According to The New York Post, a company in China forced it's staff to crawl on their hands and knees as a form of public punishment. The staff reportedly failed to achieve their year-end goals. 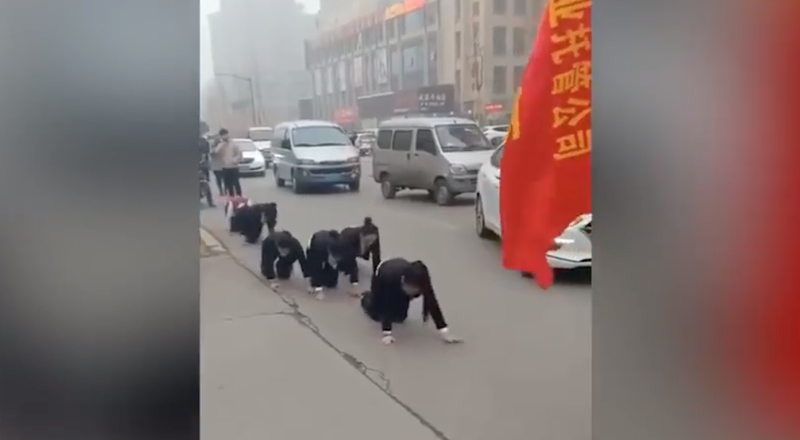 In the video, the employees can be seen on all fours as they crawled through the busy traffic. All of the crawling workers were female and they work for a company that sells beauty products. Police arrived and stopped the crawling when they were informed of the group's behaviour.